Not just for windows! 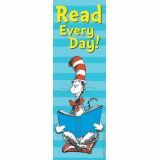 Static cling vinyl sticks to any surface. Reusable. Each sheet is 12" x 17". 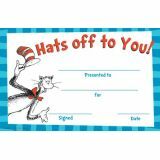 Cat in the Hat™ Hat's Off to You Award. 36 per pack. 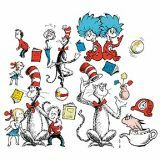 The movie "Dr. Seuss' The Cat in the Hat"  2003 Universal Studios and DreamWorks LLC. 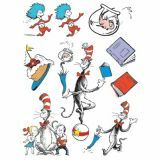 Based on The Cat in the Hat book and characters ™ &  1957 Dr. Seuss Enterprises,L.P. Licensed by Universal Studios Licensing LLLP. All Rights Reserved. 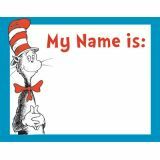 Cat in the Hat™ Name Plates. Peel and stick. 9 5/8" x 3 1/4". 36 per pack. Cat in the Hat™ Name Tags. 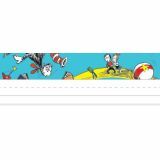 One design 40 per pack. 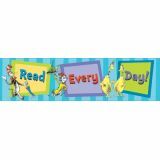 Banner 45" x 12". Folds flat for easy storage. Measures 12" x 17". Reusable. 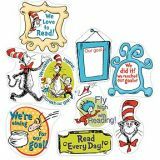 Cat in the Hat™ Classroom Decorations. Over 530 stickers conveniently packaged in an easy-to-use pad. 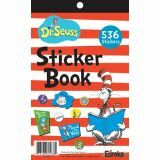 Each sticker book contains 8 pages that measure 5 3/4" x 9 3/8". 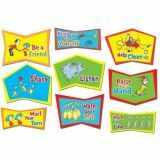 Various items for teachers, including recognition awards, teacher cards, bookmarks and stickers. Packaged in a sturdy keepsake flip-top box. Each product is separated by a labeled index tab. Easily refillable with other designs. 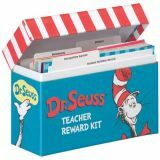 Box measures 9" wide x 6"
Let Dr. Seuss "rule the school" with 9 signs that encourage manners and respect. Each sign is 15" wide by 8" to 12" high.